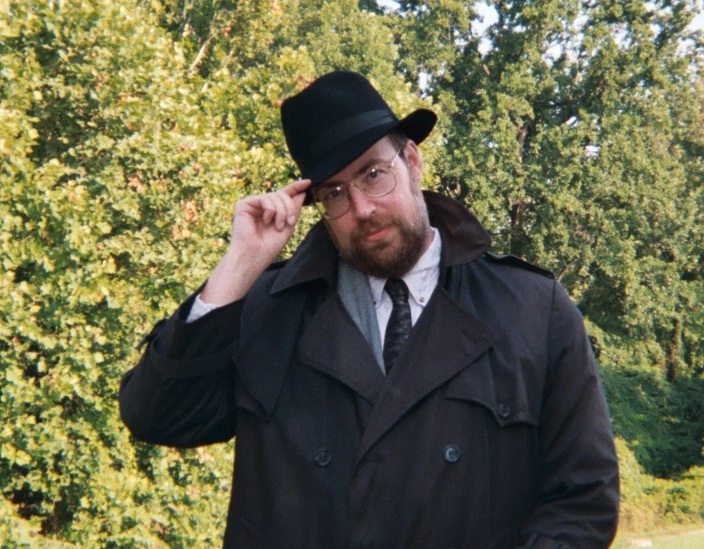 A Pius Geek: #SadPuppies ask -- who's rabid? After the Sad Puppies 4 list came out last week, things went weird. Very weird. How weird, you ask? As I mentioned last week, a comment at File 770 called me "The next John C. Wright." Which, frankly, I'll take becoming the next bestsellling Catholic SFF writer, compared to golden age sci-fi. But I'm relatively certain that they didn't mean it as a compliment. And then, things got stranger. 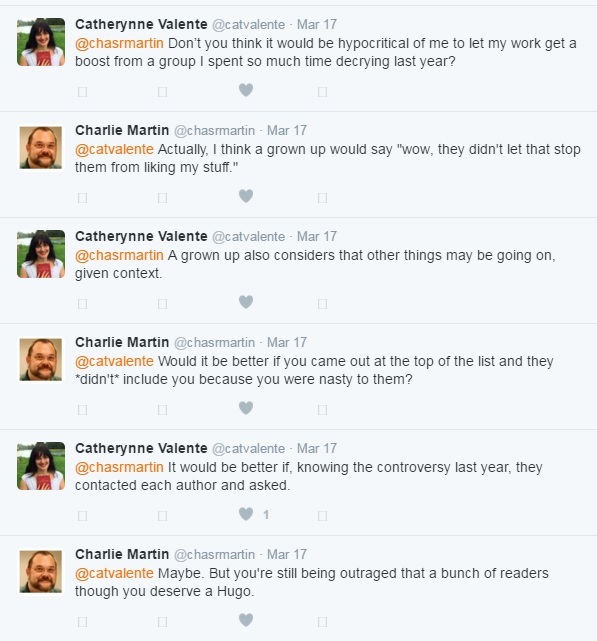 For example, I was going through the Twitter Stream for @SadRbtPuppies, and got Cat Valente versus Charlie Martin. I saw this at ... I want to say midnight, on Saturday ... and it went on and on, and round and round. I'm sure you can find the thread. But it basically boiled down to "I hate the Sad Puppies, but people at the SP4 page liked my work. THEY MUST BE UP TO SOMETHING!!!! Are you suggesting that people just liked my work? YOU'RE ATTACKING ME!!!!!" Can't make this stuff up. She actually demanded that she be consulted ... about people liking her books in public. "Oh wait," she backtracks, "I don't mind it in public, but just not there." Uh huh. Valente finally admits to being on another list, Locus, but demands that people acknowledge THE CONTEXT. While she doesn't outright say "Vox Day," you get the impression that she's seeing something flicker in the shadows, behind Sad Puppies, and it Must Be VVVOOOOXXXXX. Nicki Kenyon went into this in detail. I recommend her in-depth look at this. Right now, it doesn’t look like a slate. Right now, it looks like a list complied by people with extremely wide-ranging tastes and interests. Right now, I’m inclined to try to mend fences across fandom in whatever little way I can by giving them the benefit of the doubt that this is all in good faith–because I want to be given the benefit of the doubt that I act in good faith. That statement still looks a little off if you've been paying attention, but I don't know where she's getting her data from ... oh, wait, it's File 770. Nevermind. And now, Martin, Valente and I seem to be coming together to beat up on Autocorrect. So ... yeah, social media is strange. Yeah, I really dislike that man. It's no wonder she's probably getting incorrect data. Though I'm told I may be too forgiving. And then there's Damien Walter, threatening to sue Kat Paulk. Why? Because fans of some Puppy-Kicking authors dared to go to Sad Puppies4.org, and say that they liked work done by the Puppy Kickers. Hey, Damien, you know it's not illegal for fans to praise writers they like in a public forum, right? Kate didn't put people on the recommendation list -- FANS DID. She just counted the numbers and posted them up. I'm going to love to see that lawsuit -- "Your Honor, they said nice things about me! Make them stop!" The only thing that would be evidence is if there was some visible way of proving that being supported by SP4 would have a negative impact on the people being on the list. Gee, I wonder if they expect blowback from their fellow leftists. Perhaps. But, honestly? This is all a few blivets of crazy going on here. Damien, though? Oh, this schmuck doubled down so hard, it hurts. 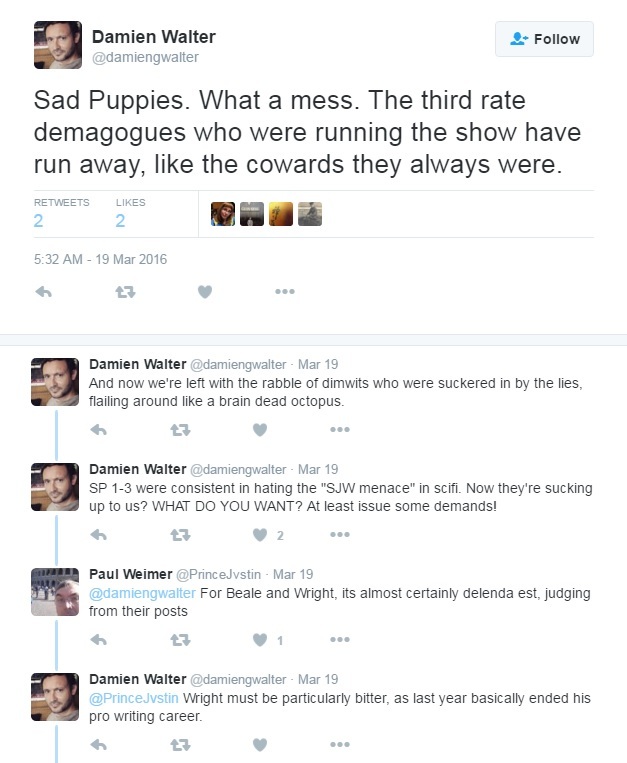 1) The "3rd-rate demagogues" ... like who? Larry? Brad? They ran away? Since when? They may not be in charge anymore, but they have other things to do. Like writing books. Or serving in the military. Or making more money than you do, Damien. 2) "Rabble of dimwits" ... so Kate Paulk, Amanda Green and Sarah Hoyt are idiots? Nice going on the sexist, misogynistic comments. We might as well add racist, because Sarah's Portuguese. Good going, you British slime. And you seem to hate EVERY SINGLE FAN of Scalzi ... and Valente ... and Ann Leckie, and someone as non-political as Jim Butcher. 3) No one is sucking up to you, or anyone else. Kate already stated her intentions openly and publicly. It's not our fault if you're incapable of reading. And oh, yeah, I'd love to get a full and detailed description of what you think are "good." I'm guessing you're not going to count Jim Butcher, but may count Anne Leckie. 4) "Last year ended Wright's pro writing career?" Not a statement you want to make TWO DAYS AFTER HE JUST PUBLISHED A BOOK. If you only mean Tor, well, say Tor. Because that's going to end well. How's that boycott coming, anyway? The level of stupid maybe be getting to me. The Puppy Kickers -- like Damien -- seem to be going full on insane. They've apparently decided that they can just spew insults, and it's reality. Wright will never be a pro writer again because they hate him, and anyone they hate must be blackballed. Brad and Larry are demagogues, because Damien said so -- and they "ran away" because Brad and Larry didn't want to play with this crap anymore. Then again, these ARE the same people that insist that Brad ran away to the Middle East, because being shot at was preferable to standing up to the great and powerful Puppy Kickers. Yes, there are some idiots who've actually stated this, online. In public. See what I mean about the stupid? It burns a LOT. Damien doesn't even seem to consider that, had more of his friends came to play at the SP4 site, they could have taken over the list entirely. But that would have meant engaging with people who disagree with him.
.@Sinapus Let me make this clear then. I don't want messages from you or any Sad Puppies. Go away, don't message me again. Yes, because actually talking with people who disagree with him might fracture Damien's delicate hold on his reality. Besides, he wouldn't want to be sullied with talking with the subhumans, now would he? It makes you wonder who the heck are supposed to be the rabid ones here. Because I have to be honest, the level of paranoia that you have to induce in order to turn "Fans like my work" into "IT'S A TRAP" does not say good things about the bubble they're living in. And Damien's BS is so thick, he could fertilize acres every time he opens his mouth. His level of schizoid makes me wonder how he could tie his shoes. It's obvious he has delusions of adequacy. And of course, SP4 states that it is the exact same thing as Locus Magazine's recommended list for the Hugos. The only difference? Locus seems to be in Tor's back pocket, while actual fans out in the real world are voting for Sad Puppies. Then there's an amazing idiot who shall not be named, stating, "There’s still a political agenda behind the ‘not-a-slate’ list. There’s still a good possibility that what is public is not what’s going on in private." Dear Puppy Kickers: delusions and paranoia are not healthy. Please see a doctor. If you believe that this is important enough to start at shadows and lash out like epileptics every time a light flickers, Vox may not be the most rabid puppy in the room. Sometimes, a recommendation is just a recommendation. "next bestsellling Catholic SFF writer"
That's actually what I had in mind. See, not all communication is unsuccessful. Heh. Always nice to get positive feedback. Walter seems to be unaware of the conspiracy to keep women out of SF Edgar Rice Burroughs and Robert Heinlein engaged in when they secretly met every Halloween in the '40s. Remember when the APs were asking if they could be included in SP4? Damien's antics prove that giving the opposition what they say they want will only lead to more hysterical complaints and demands. Happily, folks are learning that the likes of Walter never argue in good faith. After briefly exchanging words with Valente on Twitter and reading her blog post, the most likely reason for the incoherent rebuke directed at her own fans is a moderate case of Stockholm Syndrome. Macmillan probably aren't too pleased that their hostage--I mean author--was praised by the Wrong Sort. I am actually surprised that 770 seemed to approve. I believe the line was "Finn went 12 rounds with Damien, though he laid him out in the first round." Which tells you how much Damien lacks credibility in the first place. There's Stockholm syndrome, being misinformed, or perhaps she's making noise in order to make certain there's no blowback from her own side. But as I don't know her from a hole in the ground, these are wild guesses at best. I've made more money on short sales alone, in 2016, than Damien has made in his entire "career" in the field. I wonder how Damien's state-subsidized novel is coming? What's it been, five or six years with nothing tangible to show for it? Methinks Damien is just another poseur with far, far more ego, than actual storytelling ability. Also, Arthur Chu is the brainiac egomaniac fat kid in class who rages at the normal world, because the normal world isn't stopping to hold its breath in awe over Arthur's astoundingly huge head. Meanwhile, the normal world keeps flicking his ear from behind, and tacking FART signs to the back of his shirt when he's not looking. Notice, he didn't teach the JEOPARDY fans to love him either. In fact, people delighted in Arthur losing. He was a lousy sportsman on that program. Lousy. There's a good reason I generally don't read Lefty-leaning novels -- a lot of them seem to have problems being coherent. Barry Eisler and Steve Alten had those problems ... though I don't know how well know either of those two are anymore, so they might be bad examples. Yeah, good old Artie. You could tell he's still a lousy sportsman -- bomb threats aren't usually the way the game of politics is played. (*cough* GamerGate DC meeting *cough*). I think he meant the genre their mothers stuck their noses up at for a half-century while preferring Ladies' Home Journal, Family Circle, Better Homes & Gardens, Women's Home Companion and McCall's, each of which separately routinely had 20 times the circulation of the best years an SF pulp ever managed, averaging between 4 and 5 million issues sold... EACH! Did the Magazine of Fantasy & Science Fiction even manage 100,000 copies sold per issue in the mid-'50s? I think he meant the biases of demographic groups who decided the SF pulps weren't worth reading. Suddenly they become interested in the '60s and onward and that magically becomes 50 years of white racism and male misogyny. This is why you can't take propagandists like Walter seriously. They don't know anything about our American genre and turn what little they do know upside-down. And this guy passes himself off as a journalist with a particular knowledge of SFF, one who doesn't do his due diligence. Why would he? Just point him at any demographic dominated by straight white men and it's a where-there's-smoke-there's-women-hatred-and-racism. Comments like this make me decide that blogger needs a like button. I think I stopped taking Walter seriously when he put up a list of "SFF authors you should be reading," and neither Goodkind nor Butcher were on it. Nor was anyone else I had ever heard of, either. This was, of course, the first time I ran across Walter, and before I even knew he was "a thing." Let me tell you what kind of guy Mr. Curious Journalist is. Right now he's hanging out in Ubud, Bali, Indonesia. Bali is one of the most fantastic places on Earth. Ubud is Bali's tourist Mecca number 2 after Kuta Beach, down near the airport. You can barely tell he's there. He spends all day Tweeting his little bon mots of wisdom from some wi-fi hotspot. When I was there, I taught myself enough of the lingo in 8 days so I could be free of tourist spots like Ubud and run off on my own. I got myself a motorcycle and tore up that whole island, including biking around the entire outer coast in a circle in 6 days. I slept alone atop Agung Volcano with a full moon, looking down on one of the most amazing sights on Earth: the giant roulette wheel 10 miles away that is Batur Caldera. Another time I walked completely around that caldera's floor in a day and a half, meeting and talking to the people who lived there, and also spent full moons sleeping alone atop both Batur Volcano in the center and Mount Abang on the rim. Our Bizarro Hemingway could actually write a pretty cool book if he got up off his hindend and stopped managing the truly amazing feat of being an internet shut-in in Bali and turning it into his mom's basement. It takes a special kind of brainlessness to accomplish such a feat. Walter's utter lack of curiosity combined with his drive to write about things he has no curiosity about is just plain weird. You can see how the history of American SFF becomes something he basically just made up out of his head according to some paranoid goofball feminist oppression narrative. Any words out of the mouths of Butler or Le Guin become the unchallenged racially and sexually wise mandates of some god who lives atop a volcano he refuses to climb. Trust me, the last guy you want to ask what Bali's like will be Damien Walter, or anything for that matter, including the back of his own hand. I'm looking forward to his book "That Time I Never Hiked the Inca Trail... Twice!" This is the guy who thinks he can see America through a computer and give us advice and he can't even see his own arse. Cat Valente is onto us. Go to plan B.
I've been trying to figure out why the insanity as well. SP4 has been relatively silent, compared to the bombast of last year at this stage, but the kickers have been, well, Rabid lately. Not sure why they're worried. From a simple look at the the numbers, 2000-3000 people should be enough to swamp out the Puppies, especially now that the Sad and Rabid have split. Assuming a lack of slates and 20% of a group needed to get a nomination, 400-600 people should be enough to overwhelm two distinct groups of 300 people each. That is, if they can get all 2-3000 No Award slaters to nominate. The retention from Final Vote to next year's nominations is pretty poor. Still, from numbers alone, SP3's sweep should not happen this year, and it's even possible that neither SP or RP gets a spot in any category. And that's assuming best behavior of all involved. So, why so serious, Puppykickers? Because Vox Day is the criminal mastermind behind everything, and he's bald, so he must have Lex Luthor powers. And a split between the Puppies? Nah, it Must Be a Conspiracy!!!! Someday, I really wish I drank. It's never too late to start a new hobby. Won't let me use my Wordpress account to post here. So Damien calls us cowards and yet he was screeching at me to stop including his ID into my tweets? I guess I'll retweet his little "coward" bit with an archive link to his shrill demand that I not reply to him. Valente's actual name is Bethany Thomas. She is guilty of cultural appropriation. However it is possible she thinks of herself as Zhe Francis Drake, and is playing a revenge prank on the Spanish Armada. If not, she needs to apply for permission from the Archivos General de Indias in Seville, Spain. However in a crunch, any Latino or Hispanic will do, since such individuals are the gateway all Anglos must pass through before dealing with the "other" in literature, films, naming conventions, soccer shirts, etc. I think this all comes about because they really REALLY believe in the "fruit of the poisonous tree" doctrine. Well that and the zeroth law is starting to have their brains reach incompatible conclusions and short circuit.